​The HERO3 is an amazing upgrade on an already amazing line of action cameras. Though it suffers from a shortened battery life, its powerful new features and improved image quality more than make up for the difference. The HERO3 has the same height and width as the HERO2, but is slimmer in the center. It measures in at a slim 2.3 x 1.6 x 0.8 inches and weighs only 2.7 ounces. The front of the camera looks almost the same as previous models except for the addition of a blue LED, which indicates Wi-Fi status. Additional LEDs for the camera's recording status sit on the top, back, and bottom of the camera. Viewing the camera from behind, the left side holds the Wi-Fi button and a small speaker. The right side houses the microSD slot, Mini-USB port, and Micro-HDMI port behind a removable plastic door. The back of the camera houses the battery, as well as the HERO port for attaching peripherals. Despite its small size and weight, the HERO3 feels very sturdy. The included waterproof casing gives the camera the freedom to dive to an incredible 60 meters. Image quality varies based on edition. The budget-friendly White Edition has a 5 megapixel (MP) sensor, while the Silver and Black Editions have 11 MP and 12 MP sensors respectively. All three cameras can take 1080p video between 30 and 60 frames per second (fps), while the Black Edition can crunch video resolutions as high as 4K. GoPro claims that the HERO3's lens is twice as sharp as that of previous models and works better in low-light conditions, and from what we've seen it's hard to argue with that claim. The Black Edition includes GoPro's Protune technology, which records raw video for editing on a computer. Raw video records video with a more neutral color palette, making it easier to tweak settings such as saturation and sharpness later. It's a welcome edition for professionals or users who like to customize their footage. Battery life ranges from an hour and a half to three hours, with the White Edition having the longest of the three. Despite their various capabilities, all three editions perform extremely well, providing a smooth lag-free experience at any resolution. The included waterproof housing adds to the versatility of the cameras, letting you bring them practically anywhere. 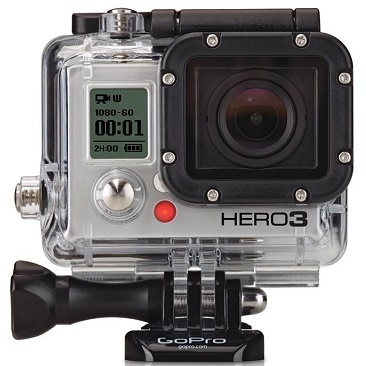 The HERO3 was designed to be backwards compatible with the add-ons available to the HERO2. BacPacs, mounts, and other accessories will work without a hitch. Thanks to the built-in Wi-Fi, you can easily connect the HERO3 to an Android or iOS phone using the GoPro App. The app provides a real-time viewfinder for the camera, controls for adjusting settings, and even a location feature which causes the phone to beep when it's in range. GoPro also provides desktop software for importing and editing photos and videos. In addition to basic editing functions, GoPro Studio lets you combine footage from two HERO devices to create 3D videos. The software still has a long way to go, but for a basic post-processing suite it definitely gets the job done. The HERO3 is leaps and bounds over the HERO2. Providing some much needed improvements, while offering some incredible new functionality, the HERO3 is a welcome upgrade from GoPro's previous cameras. The price and feature range of the various editions ensure there's a GoPro for novices and experienced users alike. To visit our homepage, click here.